Hindu Saints & Seers give commandment of Dharma to Govt: ‘Either Make Law Or Bring Ordinance’ For Ayodhya Ram Mandir. 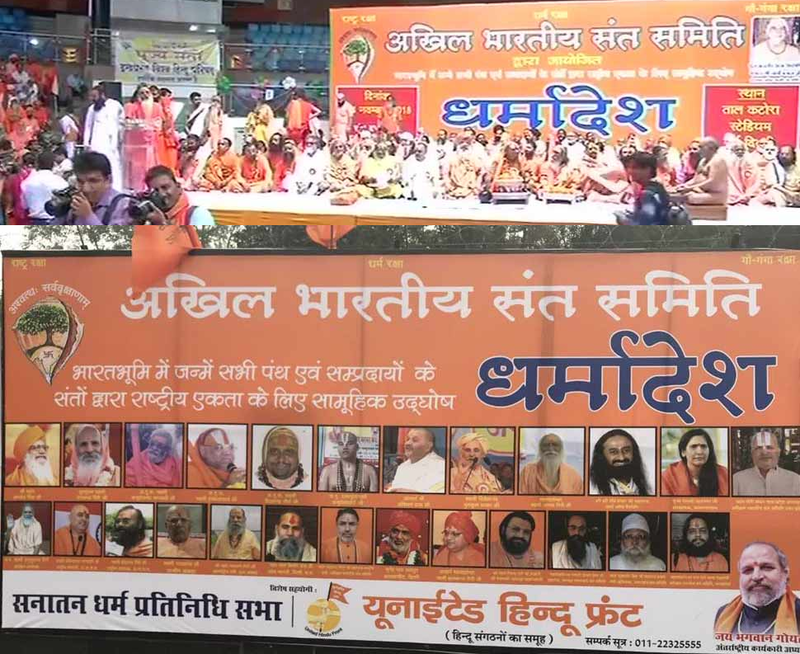 Upendra Bharti | HENB | New Delhi | Nov 4, 2018:: The Higest Spiritual Leaders, Saints and Seers who were most influential part of the two-day (3rd & 4th Nov) ‘Dharmadesh Sant Sammelan’ held under the auspices of the Akhil Bharatiya Sant Samiti (All India Saints & Seers Committee) in Talkatora stadium in New Delhi, pronounced a ‘Dharmadesh’ (commandment) o the Central Govt of India that clearly states that ‘either make law or make ordinance’ for Ayodhya Ram Temple. The convention have announced mega conventions at four cities, namely Ayodhya, Nagpur and Bengaluru and Delhi in the time frame of Nov 25 – Dec 09, on the Ayodhya Ram Mandir issue. 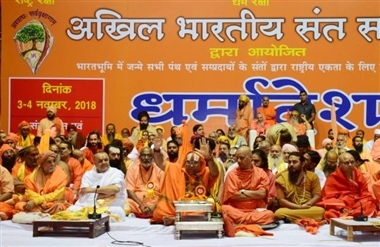 This comes after Jagadguru Ramanandacharya Swami Hansadevacharya, on behalf of all the saints, said that there should be ‘no more talks or compromises, either make law or bring ordinance’. Akhil Bharatiya Sant Samiti gave commandments for the Hindus not to be misdirected by the anti-Hindu and anti-Ram Temple elements and political parties anyway and be united for the movement of Ram Temple in Ayodhya. 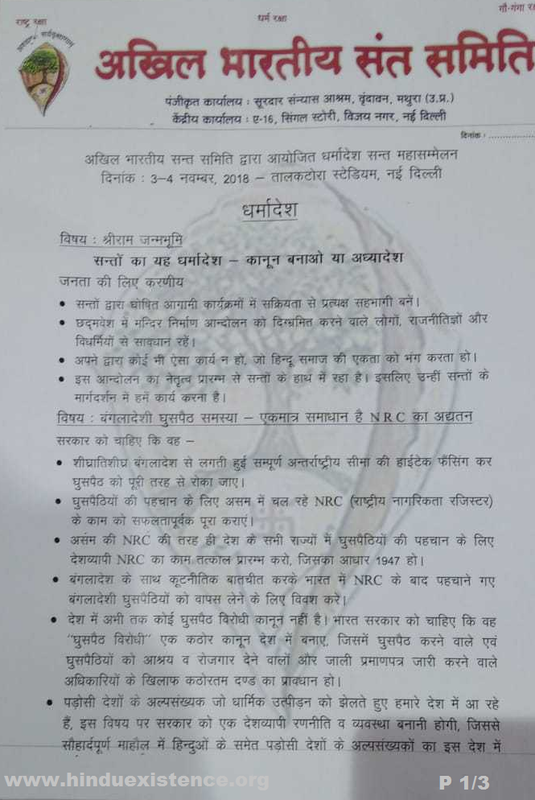 The Akhil Bharatiya Sant Samiti’s press release includes various Hindu demands ranging from Ayodhya Ram Temple to Cow Protection….. Protection of Ganga to Freeing Hindu Temples from Govt clutch….. Driving out Bangladeshi and Rohingya Infiltrators to National Register of Citizens…… Franchising Hindu Voting Rights to Criticism of NOTA. The Seer body also planned to organize meetings in 500 districts throughout the country from November 25 to mobilise support for Ram temple+. Earlier in the day, Art of Living founder and Ayodhya mediator Sri Sri Ravi Shankar, while addressing the ‘Sant Sammelan’, stated that there are three options that can be opted for the construction of Ram Mandir in Ayodhya. Addressing seers at Sant Sammelan in Delhi, Sri Sri Ravi Shankar said that Ram Temple is not for saints but it is for common man of India and there must grand Ram temple built in Ayodhya. More than 300 top seers alongwith other 2700 member saints and seers of the Samiti present in the Sammelan have been demanding PM Modi to start the construction of Ram Temple as soon as possible. Sri Sri Ravi Shankar also said, though we all respect the Supreme Court’s decision, the apex court must review its Sabarimala verdict. Sri Sri further said that Sabarimala is related to people’s sentiments and like other religions have their traditions, everyone must respect Hindu rituals. 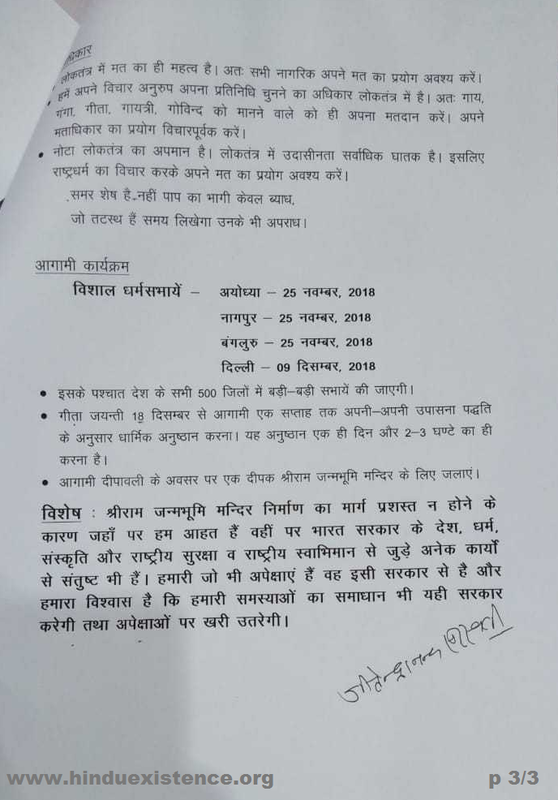 Meanwhile, the onus is being put on the BJP-led central government to come up with a quick resolution for Lord Ram’s temple to be built in Ayodhya in the wake of Supreme Court’s recent order on this matter in October wherein hearings in the case were delayed till January 2019 at the very least. In the sideline of the convention, the prominent Ayodhya Seer and present President of VHP controlled Ram Janmabhoomi Nyas ans ex-BJP MP, Dr Ramvilas Vedanti told HENB: “The construction of Ram Temple at the very birth place of Lord Rama in Ayodhya may start at any moment within Dec 31st under the instruction of the Sant Samaj as it does not depend on any instruction from political parties or other forums. Govt. in the Center must realize the Hindu urge to see the start of Temple at Ramjanambhoomi. We believe the Govt in the Center and Uttar Pradesh will pave the way to build Ram Temple with urgency”. The Verdict or Commandment of the Seers expressed its satisfaction on the work of present Govt in the center for its performance towards national pride, its cultural exploration and security measures; but conveyed its utter de-satisfaction on the indefinite delay of Ayodhya Ram Temple Construction and fulfilling Hindu demands. __inputs from Republic, TOI and Jagran. __video courtesy: Zee News and NewsX. protection. This is a message of Sri Hanuman Seva Sena. 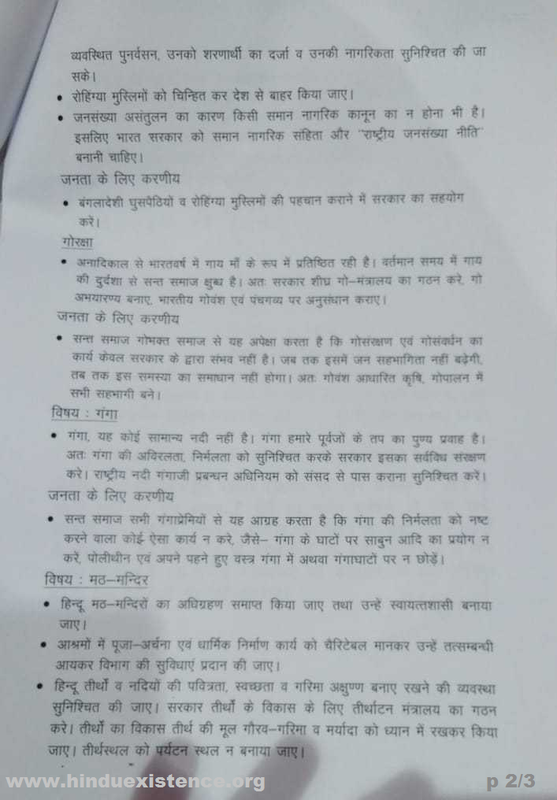 This entry was posted on November 4, 2018 by hinduexistence in Ayodhya Ram Janmabhoomi Temple Movement, Cow Protection, Demand for Cow Protection, Demand for Ram Temple at Ayodhya, Demand of Common Civil Code in India, Demand of Uniform Civil Code, Hindu Advocacy, Hindu Agenda, Hindu Conference, Hindu Conversion, Hindu Demand to Ban Cow Slaughter, Hindu Demand to save Ganga, Hindu Demand To Save Sabarimala, Hindu Leadership, Hindu Movements, Hindu Politics, Hindu Religious Issues, Hindu Rights, Hindu Rituals, Hindu Saints, Hindu Solidarity, Hindu Unity, Hindu Vote Bank and tagged Akhil Bharatiya Sant Samiti, Dharmadesh Sant Sammelan, Dr. Ramvilas Vedanti, Fulfill Hindu Demands, Jagadguru Ramanandacharya Swami Hansadevacharya, Make Law Or Bring Ordinance for Ayodhya Ram Mandir, Sri Sri Ravi Shankar, start of Temple at Ramjanambhoomi, Verdict of Dharma.